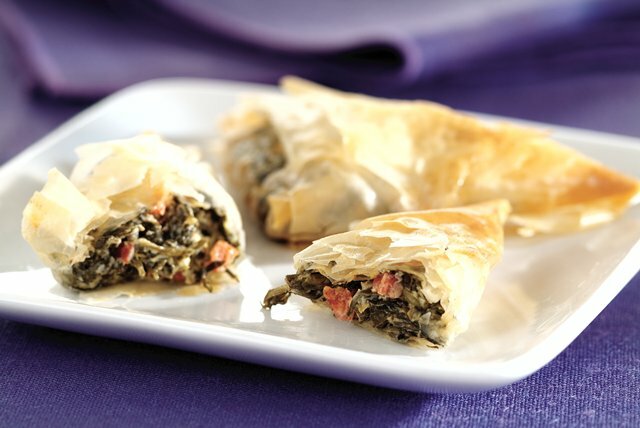 You can buy appetizers like these Spinach-Cheese Triangles in the frozen food section. Or make them yourself and take all the credit. Preheat oven to 375°F. Beat cream cheese, spinach, peppers and garlic salt with electric mixer on low speed until well blended. Place 1 of the phyllo sheets on clean work surface. Brush lightly with butter. Cut phyllo into three lengthwise strips. Spoon about 1 tsp. of the filling 1 inch from one end of each strip. Fold end of phyllo over filling at 45-degree angle. Continue folding as you would fold a flag to form a triangle that completely encloses filling. Repeat with remaining phyllo and filling. Place triangles, seam-sides down, on baking sheet; brush with remaining butter. Bake 12 to 15 min. or until golden brown. Serve warm. Keep an eye on portion size when you enjoy this rich appetizer. Unfold phyllo sheets; cover with wax paper and a damp towel. Keep covered until ready to use to prevent phyllo from drying out. Assemble triangles as directed; do not brush tops with butter. Place, in single layer, on baking sheets. Freeze 1 hour or until frozen. Place in freezer container between layers of wax paper. Freeze up to 1 month. Bake as directed, brushing lightly with remaining butter just before baking.